- Roughly 10% of all listings have been reduced since last week. - New and decreased listings track remarkably well. Not a lot of surprises here. 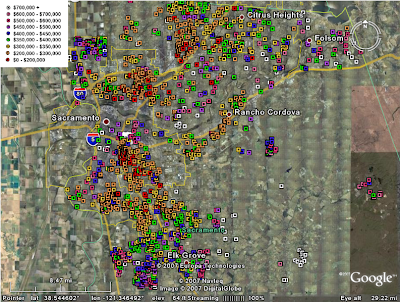 North Highlands, Oak Park, South Sacramento, and Del Paso Heights are heavily represented. 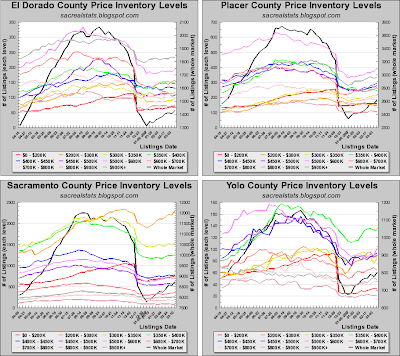 Sacramento asking prices have officially returned to the steep downward trend that began last summer, dropping 8.9% since then. 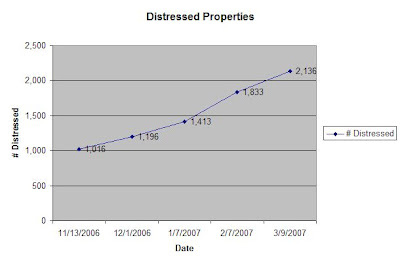 Agent Bubble should also have some new distressed property numbers posted here soon. 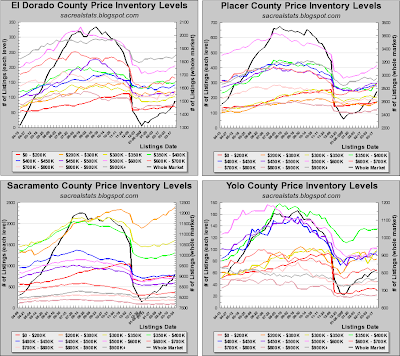 Suffice to say, the data aren't giving us a lot of good things to say about the selling environment in Sacramento. 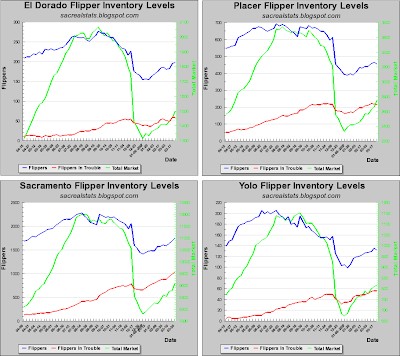 Inventory is shooting for record highs, flippers are going broke, and asking prices are dropping rapidly. And the selling season has only just begun. Where Are All The Flippers? 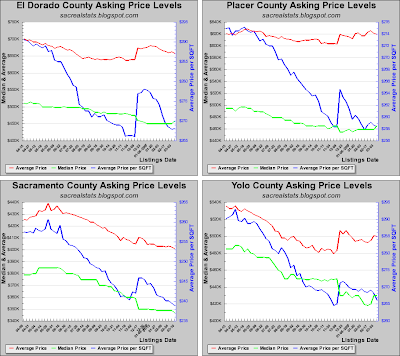 Sippn and others had an excellent question about whether recent median and average asking price drops were due to newer, lower-priced listings, or price reductions on existing inventory. 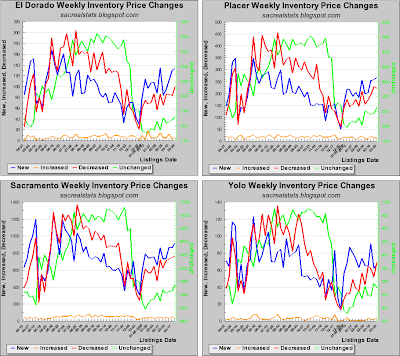 Although a close examination of the price inventory level graphs can give us some idea, it might be useful to know what kind of price changes the bulk of the inventory is seeing each week. 1. Roughly 10% of all listings have price reductions on a weekly basis. 2. Less than 2% of all listings have price increases on a weekly basis. 3. The number of new listings and the number of decreased listings follow a similar trend. These graphs are just a start. (For example, it would also be interesting to know how many "new" listings are really relisted after a long period of dormancy.) So, let me know if you have any other ideas or suggestions on how to improve this. 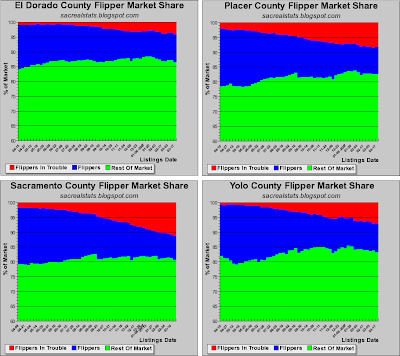 Both Yolo and Placer are seeing similar trends emerge, but they are too early to call. 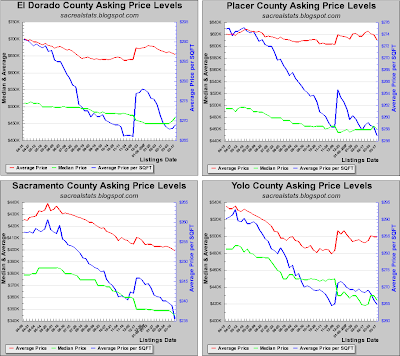 Could this be the start of a "Spring Thaw" in prices? Stay tuned. This shouldn't come as a surprise, but the numbers keep rising! 15.92% of the 4 county market is now either a short sale, bank owned, or pre-foreclosure. And keep in mind, this number is probably a few points lower than it should be because agents aren't filling in the MLS fields correctly to account for the distressed listing. A few months ago, I guessed that we'd top out at 16% of the market for distressed properties, but now I'm beginning to wonder if I was too optimistic...Anyone think it will get to 20%??? 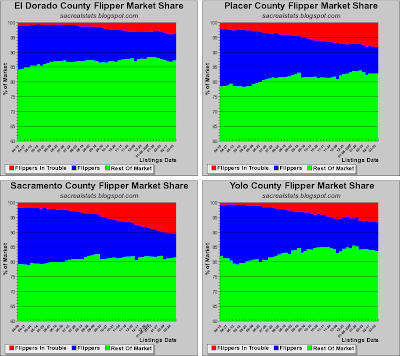 57% of all flipper listings are now in trouble, and the year is really just beginning. 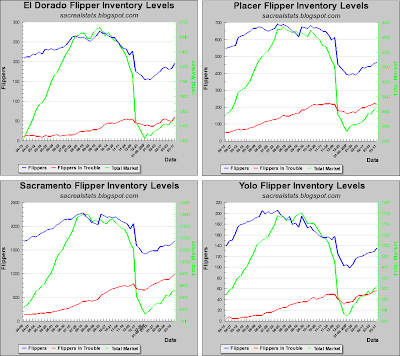 Flipper inventory in Sacramento County held at over 2000 listings until early November last year; currently there are only 1626 flipper listings. "Hold onto your hats and glasses…"
Four-county inventory stood at 13,584 on March 9. Last year we didn't have that kind of inventory until mid-May. We are beginning to see an up-tick in inventory at most price ranges as well. 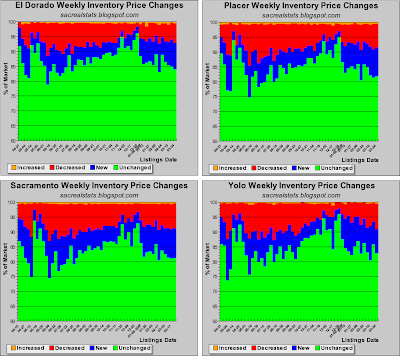 Spring is springing, at least from an inventory perspective. 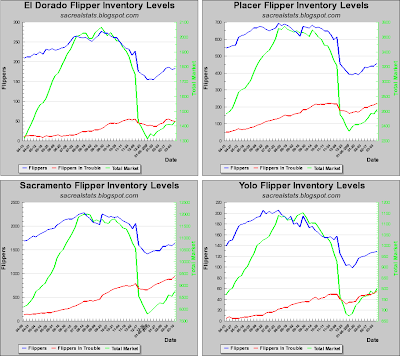 Sacramento has resumed the downward trajectory it had since last summer, while Placer and El Dorado seem to be flattening. With far few houses on the market than the other counties, Yolo trends will always be volatile, but asking $/sqft seem to be on the decline there as well. Finally, I have a couple of favors to ask. 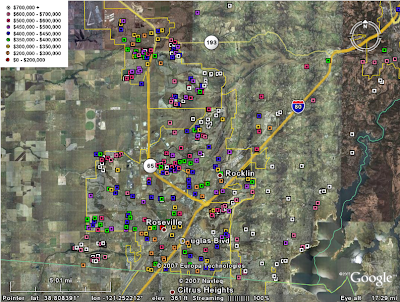 One, if anybody is flying into town and their approach takes them over Elk Grove or Natomas (i.e. Southwest), could you get a window seat and snap a few digital photos of the new houses below and email them to me? 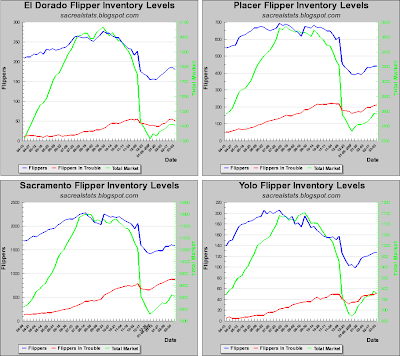 I've got an interesting idea I want to test… Also, I'm looking for information on the condition of local lending companies here in Sacramento. How's business these days? Is the purported national credit-crunch having any effect on you? This subprime blowout is going to make Enron look like child's play. February 2007 sales data surprised to the upside. Many of us (including myself) expected a continuation of the downturn, both in y-o-y performance and dollars per square foot. Not so, says the data. Average $/sqft increased to $234 from $227, sales volume held steady at 807 units sold, and average priced paid (not median) went up from $377K to $390K. Also, I'm sure we can expect a front page headline from the Bee when they release this story. 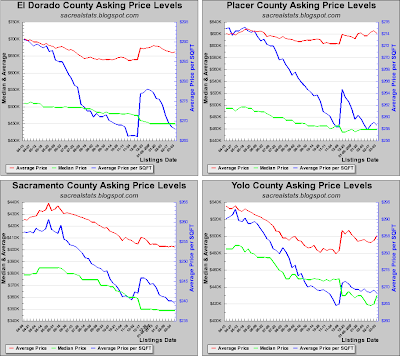 Keep in mind that even though prices went up, sales levels remained extremely low. With sales this low, volatility will cause prices to skew dramatically in both directions. Hat tip to anon1137 for guessing correctly. Real quick this week. I was out of town this weekend so not a whole lot of time to do this. "Just the graphs, M'am." 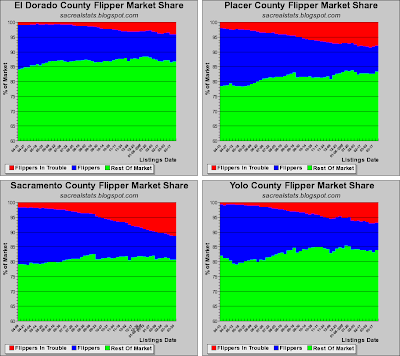 Bottom line: listing inventory fell due to typical monthly drop-off, asking prices were steady in every county except Yolo, and flipper inventory remained unchanged.